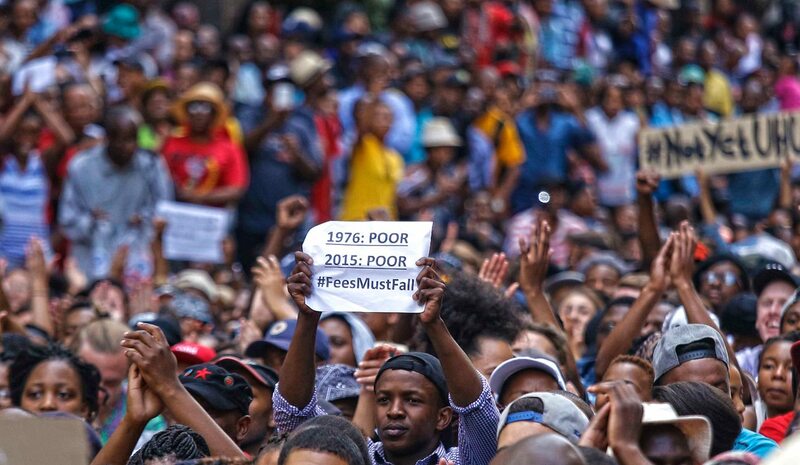 Over two weeks University of Witwatersrand (Wits) students helped make history, but on Monday evening the movement that inspired protests at campuses across the country fractured, ending in division and allegations of political interference. But what they've started goes beyond Wits. By GREG NICOLSON. Since students at Wits sparked a national student movement, three things have defined its iconography. There is an image by Marco Longari of incoming Student Representative Council (SRC) president Nompendulo Mkhatshwa, marching in the rain, head bowed and fists raised. It’s one of many images of young, black, women leading the demonstrations. Then there’s the violence and resistance. The media will always feature images of violence, regardless of its scope and importance, but there are also visuals of resistance: students standing up to authority despite the risks. Finally, there is non-partisan politics: students from different groups, African National Congress (ANC) and Economic Freedom Fighters supporters, and others too, together on the front line, united by a common cause. That unity was shattered on Monday night when students and supporting staff met, once again, at Wits to ask: What next? If you support the movement, the fracture was a definitive blow. All of the symbols, the feelings that sent you to the Union Buildings, or led to your donations, were undermined. The cynics can rejoice. What next? There’s a formal answer. While scuffles were taking place in Senate House, renamed Solomon Mahlangu House by students, between those who want to continue to close the university and those who want to sit exams, Wits issued a statement confirming a deal with the SRC. Academic programmes will resume on Wednesday and a new examination timetable will be released this week. Presumably they had agreed on the plan vice-chancellor Adam Habib presented earlier in the day. It addressed outstanding issues after President Jacob Zuma announced a freeze on university fee increases for 2016. Habib said the university would address increases in the up-front fee payment and establish an internal commission on outsourcing. Wits will find the resources to support the children of employees’ study at the university, write a workers’ charter, and waive disciplinary action against those involved in legitimate forms of protest. What next? The other answer is that Wits students never had the chance to decide. Joining the dots of the allegation goes something like this: Once the #FeesMustFall movement spread across the country, dominating local news and featuring internationally, and attention shifted from vice-chancellors to the government, the ANC had to intervene. Party secretary-general Gwede Mantashe met with the ANC-affiliated Progressive Youth Alliance (PYA) on Thursday, creating a splinter in student unity, and on Friday Zuma would save the day by announcing at the Union Buildings there would be no fee increases in 2016. It didn’t go as planned. A group of protesters at the Union Buildings violently fought the police and derailed the president’s address. Instead of seeing an end to the mass protest, Friday was dominated by stun grenades, tear gas, rocks and burning portaloos. According to some Wits students, on Sunday night, after a mass meeting, PYA leaders met outside the broad decision-making group to discuss ending the protest. There’s talk of the meeting being stormed by other students, incriminating notes being found, a video, even references to money being paid to the SRC to end #FeesMustFall in the interests of the ANC. It would be poor politics if major political parties did not try to influence one of the major movements of the democratic era, and all the key parties have tried. But the claims against the ANC and PYA are so far just allegations. It’s simply confusing. Some claim the SRC sold out the students while others point to different outsiders trying to influence the students. That’s where the Wits protest appears to end. It has buckled under the weight of its own success as forces beyond its control have muscled in. Sure, there were many who wanted the university to reopen and for exams to be held, but group decision making was overcome by allegations of subterfuge and one of the key elements of the movement, discussion, was subverted by force. But the Wits movement, which captured the spirit of the Rhodes Must Fall protests and built on years of demonstrations at campuses around the country, has been much more than its recent divisions, even if they always existed beyond the front-page photos. The statement might have been a concession, but the last two weeks have secured short-term advances for students and forced ignored issues like outsourcing and free education onto the national agenda. Varsities like Rhodes and University of Pretoria have achieved key demands while many others continue to protest. “One needs time to regroup and strategise appropriately with effective tactics. We have won our short-term goals through short-term strategies. We have won the battle, a great battle, but the war for free education continues with a renewed strategy,” said the Wits SRC. The protests at universities across the country are bigger than Wits. That’s why the movement spread and that’s why the iconography touches those who have never been to the university and don’t normally care for student issues. It’s also why national political parties are supposedly involved.